When you’re trying to push your carb ratio down when first doing a keto diet or even just to balance out a meal that’s slightly carb-heavy, fat bombs come in handy. This one combines the familiar flavours of chocolate and nut butter (I mix almond and peanut to make it a little healthier) with coconut oil as a healthy fat base. 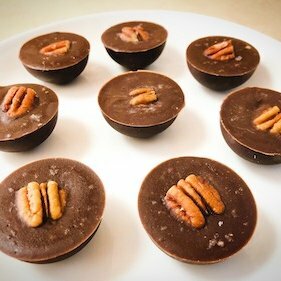 Throw in the pecan piece at the end for texture and you have a delicious super-keto treat! In a small sauce pan, melt the coconut oil and nut butters over low heat, stirring regularly. Whisk in the remaining ingredients and remove from heat. Pour mixture into a pyrex measuring cup then pour into silicon mould. Place a pecan piece on top of each fat bomb. Freeze for at least 4 hours (overnight is best). 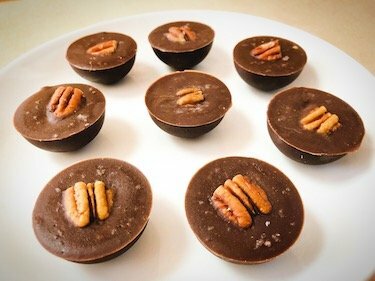 Makes 15 small fat bombs (using this silicon mould). 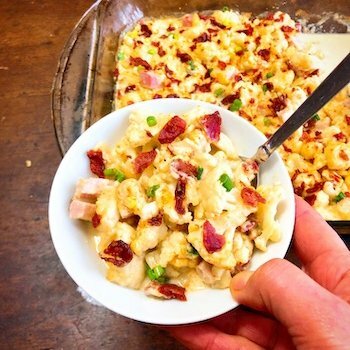 Looking for a super hefty keto brunch to fill you up for half the day? 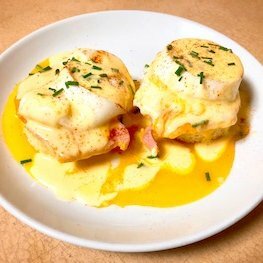 Look no further than eggs Benedict! Warning: it is very calorie-dense. Depending on your activity levels, it could account for over half your day’s calories. One day, one the way home from kayaking, my friend wanted to stop by Choices Market for some groceries. If you don’t know the store, it’s kinda like Whole Foods less upscale, less expensive cousin. 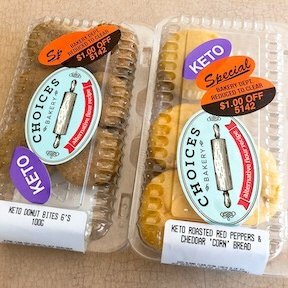 I found some keto baked goods on sale, and knew I had to try them.